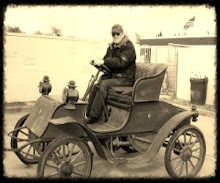 Somewhere between an early car and the head-in-the-bed scene in The Godfather, the Horsey Horseless, the brainfart of inventor Uriah Smith of Battle Creek, Mich., was intended to soothe the skittish nerves of our equine servants. 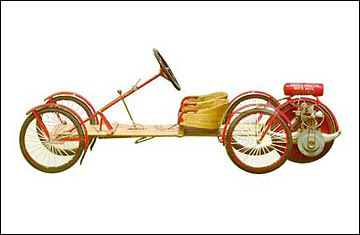 A wooden horse head was attached to the front of the chuffing buggy in order to make it resemble a horse and carriage (Smith recommended the horse head be hollow to contain volatile fuel — another great idea). "The live horse would be thinking of another horse," said Smith, "and before he could discover his error and see that he had been fooled, the strange carriage would be passed." Stupid horse! It's not clear if the Horsey Horseless was ever actually built or if it is a chimera of auto history, but it reminds us just what a radical, hard-to-conceptualize thing a horseless carriage was. Milton Reeves had a very hard head and, apparently, very poor eyesight. 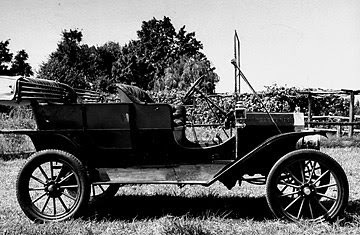 While the general conformation of the automobile was largely sorted out in the first decade of the 20th century — particularly that business about four wheels — Reeves thought perhaps eight or a minimum of six wheels might provide a smoother ride. Welding in some bits to a 1910 Overland and adding two more axles and four more guncart-style wheels, Reeves created the OctoAuto, proudly displaying it at the inaugural Indianapolis 500. Like its Marvel Comics-worthy name, the car was a bit of a monster, measuring over 20 ft. long. Talk about scaring the horses. Zero orders for the patently ugly and silly OctoAuto apparently didn't discourage Reeves, who tried again the next year with the Sextauto (six wheels, single front axle design). Reeves is remembered today as the inventor of the muffler, which is far from ignominy. A 3,200-lb. 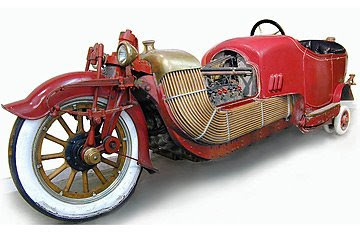 motorcycle with training wheels, a V8 engine and enough copper tubing to provide every hillbilly in the Ozarks with a still, the Scripps-Booth Bi-Autogo was the daft experiment of James Scripps-Booth, an heir of the Scripps publishing fortune and a self-taught — or untaught — auto engineer. The Bi-Autogo was essentially a two-wheeled vehicle, carrying its considerable heft on 37-in. wooden wheels. At slow speeds, the driver could lower small wheels on outriggers to stabilize the vehicle so it wouldn't plop over. This is not a case of the advantage of hindsight; this was obviously a crazy idea, even in 1913. The Bi-Autogo does enjoy the historical distinction of being the first V8-powered vehicle ever built in Detroit, so you could argue it is the beginning of an even greater folly. By 1920, the automotive was no longer a primitive experiment. Companies such as Rolls-Royce, Cadillac, Hispano-Suiza and Voisin were making potent and luxurious automobiles, the technical achievements of the age. And then there was this, the Flyer, which is no more than a motorized park bench on bicycle wheels. No suspension, no bodywork, no windshield. 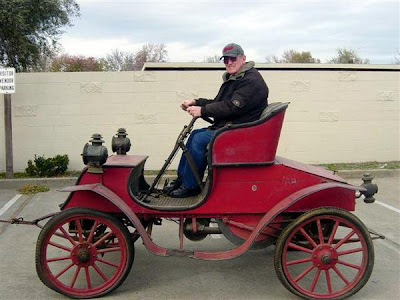 It was actually a five wheeler, with the dinky 2-hp Briggs and Stratton engine driving a traction wheel on the back, like a boat's outboard motor. The Flyer represents something we'll see several times on this list: The drive to make the absolute cheapest, most minimal automobile possible. Designer-genius R. Buckminster Fuller was one of the century's great nutjobs, a walking unorthodoxy who originally conceived of the Dymaxion as a flying automobile, or drivable plane, with jet engines and inflatable wings. It would be one link in his vaguely totalitarian plan for the people to live in mass-produced houses deposited on the landscape by dirigibles. 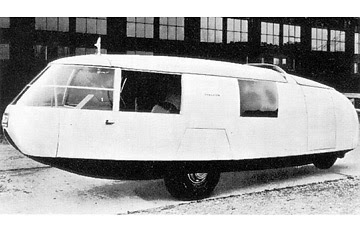 Okayyyy...Deprived of wings, the Dymaxion was a three-wheel, ground-bound zeppelin, with a huge levered A-arm carrying the rear wheel, which swiveled like the tail wheel of an airplane. The first prototype had a wicked death wobble in the rear wheel. The next two Dymaxions were bigger, heavier, and only marginally more drivable. The third car had a stabilizer fin on top, which did nothing to cure the Dymaxion's acute instability in crosswinds. A fatal accident involving the car — cause unknown — doomed its public acceptance. Though unworkable, this three-wheeled suppository was the boldest of a series of futuristic, rear-engined cars of the 1930s, including the Tatra, the Highway Aircraft Corporation's "Fascination" car and, everybody's favorite, the Nazi's KdF-wagen. The Airflow's "worst"-ness derives from its spectacularly bad timing. Twenty years later, the car's many design and engineering innovations — the aerodynamic singlet-style fuselage, steel-spaceframe construction, near 50-50 front-rear weight distribution and light weight — would have been celebrated. 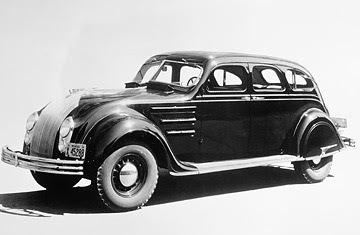 As it was, in 1934, the car's dramatic streamliner styling antagonized Americans on some deep level, almost as if it were designed by Bolsheviks. It didn't help that a few early Airflows had major, engine-falling-out-type problems that stemmed from the radical construction techniques required. Chrysler, and the even more hapless Desoto, tried to devolve the Airflow stylistically, giving it more conventional grill and raising the trunk into a kind of bustle (some later models were named Airstream), but the damage was done. Sales were abysmal. It wouldn't be the last time American car buyers looked at the future and said, "no thanks." 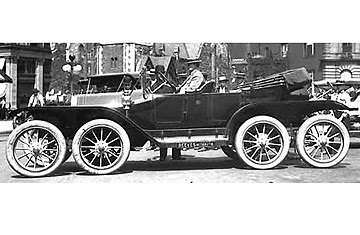 1904 St. Louis is my Dads car, he sold it last year to the company that built them in St. Louis Mirrouri. His father's father bought it used in Fullerton Calif. back in the late 1900's. 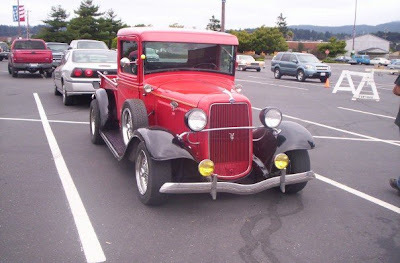 This car was an awesome car with wooden wheels, crank engine and lantlerns for head lights. enjoy the pictures.